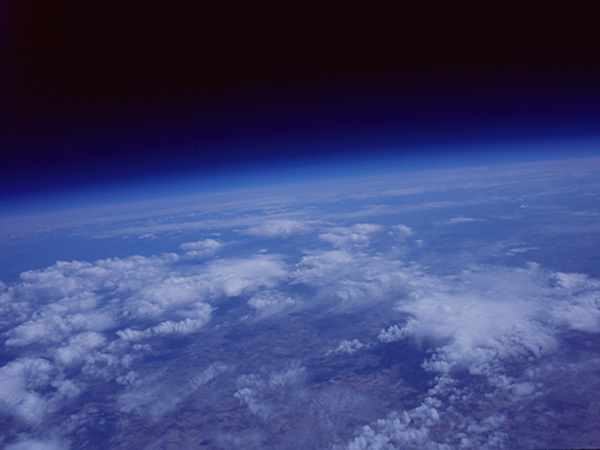 For his work High Altitude Balloon Harmless Amateur Radio Equipment (2013), Kevin Schmidt launched a large camera 35,000 metres above Earth by attaching it to a weather balloon. The timing and right conditions to release the shutter were carefully calculated so that the camera pointed away from the sun toward the horizon. The resulting 4″ x 5″ transparency photograph of the stratosphere is presented as a large projection in the gallery. The viewer standing between the projector and the image becomes part of the aerial scene as a silhouette. Playing with themes of modernity, landscape, and technology, this work suggests a new form of the sublime – one not indebted to the romantic idea of experiencing nature first-hand, but based on extending the human vision by technical means.